These lentil burgers are the perfect veggie burgers. 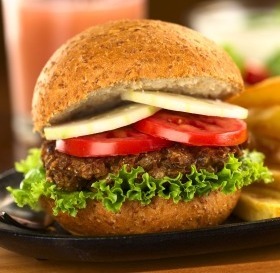 If you are looking for burger recipes that leave out the heavy meat, these are a must try. Lentils are so healthy for us and are a great replacement for meat in vegetarian recipes. In a medium bowl mix together the lentils, celery, onion, carrot and the egg. Add the salt, pepper and worcestershire sauce and mixing everything together well. Shape the mixture into patties. Roll them lightly in the flour. Fry the lentil burgers in a bit of oil in a medium hot pan until they are brown and heated through. These lentil patties can be frozen and reheated if you desire. You can serve these vegetarian burgers as you would any other burgers. I like them on a whole grain bun with your favorite burger toppings. I love lentils. They make a fantastic soup, great salads and great patties or burgers. You can also add the flavors of the Mediterranean by topping your lentil patties with hummus and tabouli, traditional Middle Eastern recipes. It is a fabulous combination. Serve it on a bun with added sliced tomatoes and onions, or eat them as is topped with the hummus and tabouli and accompanied by a large salad. It is a fantastic lunch recipe or an easy dinner recipe, especially if you cook the lentils ahead and keep them in the fridge ready to make into burgers. The recipe calls for the burgers to be coating in just a bit of flour. The flour helps the burgers to stay together while they cook. If you need these veggie burgers to be gluten free, simply replace the wheat flour with an equal amount of your favorite gluten free flour. As long as it will taste good after frying it a bit, it will be fine. You don’t need a lot of oil to fry these patties. Just enough to give them a nice crunchy coating on the outside. You can also use non-stick spray if you want to keep them really low fat. I like the texture that comes from using just a bit of oil. I hope you enjoy them. If you do like this recipe, I’d love you to Pin it to Pinterest, Tweet about it, Like it on Facebook and leave a comment and your own recipes below. These lentil burgers are just one of our easy dinner recipes suggestions. Find them all here.